The howling whine of a speeder bike whipping between trees or across endless wastes of sand is an iconic part of the Star Wars saga—nearly as much as the whoosh of a lightsaber igniting or Darth Vader’s mechanical breathing. Speeder bikes have been used for transportation and thrill-seeking across the galaxy, and they also play a pivotal role in battle. Soon, you’ll be able to bring these lightning-fast speeders to your Imperial armies with the 74-Z Speeder Bikes Unit Expansion for Star Wars™: Legion! Within the 74-Z Speeder Bikes Unit Expansion, you’ll find two unpainted, easily assembled 74-Z Speeder Bike miniatures, ready to add another unit to your army. One of the miniature sculpts is identical to the 74-Z Speeder Bike miniature included in the Core Set, while the other offers a variant design to add new diversity to the miniatures in your army. Like seven other expansions and the Star Wars: Legion Core Set, the 74-Z Speeder Bikes Unit Expansion will release on March 22nd, granting a depth to your army building from the very first day. You can pre-order your copy of the 74-Z Speeder Bikes Unit Expansion and other expansions from your local retailer and online through our webstore today; then, read on for more information! Within the Imperial units initially releasing for Star Wars: Legion, you can already see the distinct roles played by each unit in your army. Darth Vader forms a rallying point for the entire army, inspiring your forces with an invincible resolve and cutting down the enemy with ease. AT-STs are powerful walkers, pumping out a devastating volume of firepower and pounding enemy forces into a pulp as you advance. Stormtroopers take their place as the rank and file troopers of your army, filling out your forces and keeping your larger, more powerful centerpiece units from being surrounded. Finally, you find the 74-Z Speeder Bikes, speedy support units that are perfectly suited for strafing enemy troops and flying from one end of the battlefield to another in a flash. The 74-Z Speeder Bikes Unit Expansion invites you to add another unit of 74-Z Speeder Bikes to your Imperial armies. These units take their place alongside T-47 Airspeeders as the fastest units in the game. They use the longest movement tool, and because of the Speeder 1 ability, they must perform a compulsory move forward at the beginning of their activation! When you combine the compulsory move with the ability to spend one or both of their actions moving, it’s plain that 74-Z Speeder Bikes are almost unmatched in terms of speed. And in fact, that speed gives the 74-Z Speeder Bikes a form of defense against incoming ranged attacks. While this unit only rolls the weaker, white defense die, their blistering race across the battlefield makes them more difficult to target, and increases their cover against incoming ranged attacks. Still, the more you can minimize attacks by slipping out of firing arcs or firing and then racing out of range, the more likely your 74-Z Speeder Bikes will survive to make a long-lasting impact on the battle. 74-Z Speeder Bikes may have stripped down defenses—but that’s just a way to make room for their Ax-20 Blaster Cannons. 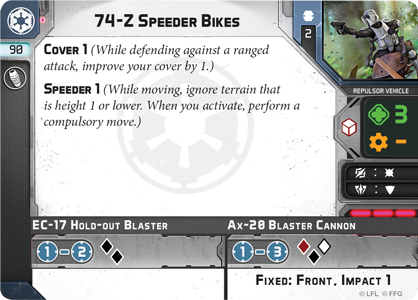 Every speeder bike is equipped with one of these blaster cannons, each firing one red, one black, and one white attack die with a limited ability to punch through heavy vehicle armor because of the Impact 1 keyword. The downside of these powerful cannons is that they’re fixed to the front of the speeder bikes—so if you misjudge your movement, or if your target manages to slip out of the way, you won’t be able to concentrate fire with these weapons. Still, you’re not without options. The scout trooper riding on the speeder bike is armed with an EC-17 Hold-out Blaster, and although this weapon is not as powerful as the speeder bike’s blaster cannon, it can be fired in any direction. If there’s any aspect that the 74-Z Speeder Bikes lack, its customizability. This unit only has a single upgrade slot, devoted to comms upgrades. Still, there are options for you to provide your 74-Z Speeder Bikes with the perfect comms upgrade. 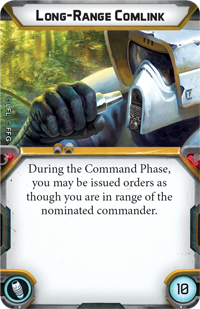 If you’re having your unit ranging far afield, you may be worried about issuing orders when your speeder bikes are out of range of your commander. 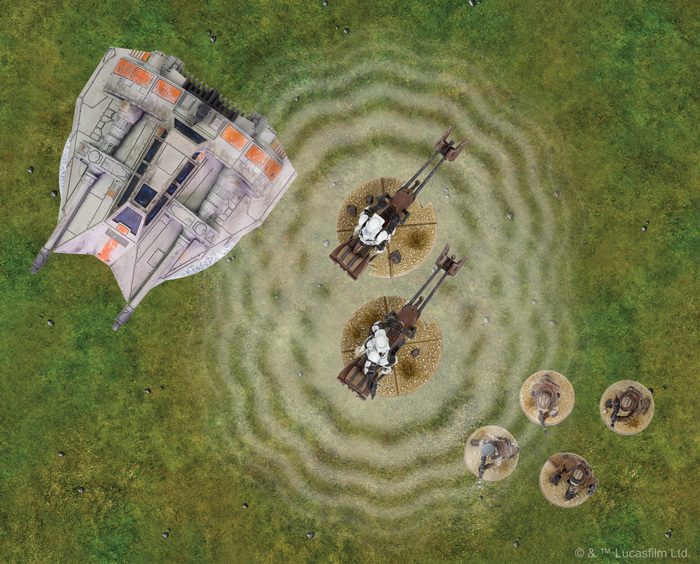 Simply equipping a Long-Range Comlink (also present in the Star Wars: Legion Core Set) means that the upgraded unit can always be issued orders, no matter how far it flies. Alternatively, you may use your 74-Z Speeder Bikes to disrupt your opponent’s plans with a Comms Jammer. 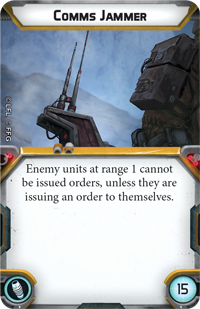 This upgrade card reads, “Enemy units at range 1 cannot be issued orders, unless they are issuing an order to themselves.” By flying your speeder bikes through enemy lines, you can disrupt your opponent’s plans, keeping him from giving a crucial order that leaves a unit vulnerable and without direction in the midst of a raging battle! The 74-Z Speeder Bikes are equipped with a Comms Jammer, preventing orders from being issued to the T-47 Airspeeder or the Rebel Troopers! Ultimately, whether you use your 74-Z Speeder Bikes as powerful attack vehicles that strafe the enemy lines, or you use them to disrupt your opponent’s commands, they’ll form a key part of many Imperial armies in Star Wars: Legion! 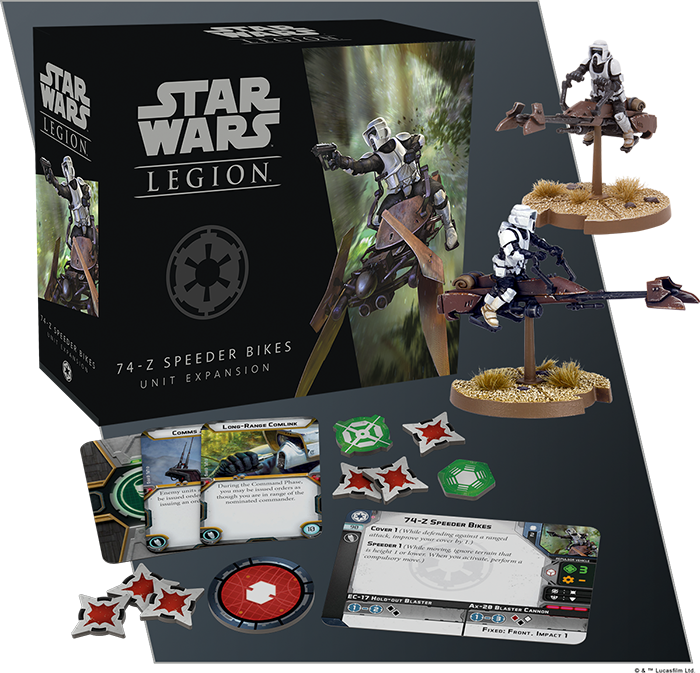 Deploy your speeder bikes to support your advancing army, and spread the might of the Empire across the galaxy—the 74-Z Speeder Bikes Unit Expansion releases March 22nd with the Star Wars: Legion Core Set and other expansions! 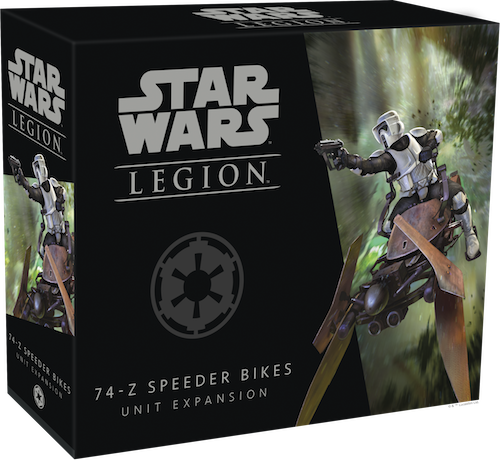 You can pre-order your copies of the 74-Z Speeder Bikes Unit Expansion (SWL06) and other Star Wars: Legion expansions at your local retailer or online through our webstore today.